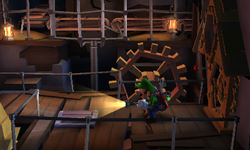 The Synchro Gantry is a room inside the Old Clockworks in Luigi's Mansion: Dark Moon. The Synchro Gantry is accessed only by taking the left door inside the Maintenance Hub. The Synchro Gantry is a small room with a conveyor belt on the top of the room. There are a few barrels and a large cuckoo clock separating the other side of the room. Inspecting the cuckoo clock causes a large bird to come out, which picks up Luigi and drops him on the other side of the room. In this area, there are several rotating gears and the same conveyor belt. The room to the left of this is the Synchronization Room. During Piece at Last, Luigi must go through the Synchronization Room to go back to the Service Elevator. The Toad cannot be taken through the cuckoo, so Luigi must shoot him into the conveyor belt after pressing the switch in the middle of the walkway. On the other side of the Synchro Gantry, Luigi needs to battle two Greenies. This page was last edited on September 16, 2017, at 03:05.